the lady approaching her. Spotting the little fairy sitting there the lady called out in greeting. The little fairy feeling afraid seemingly disappeared. Still the fairy did not re-appear. Quiet a few moments passed and the lady sat enjoying the sunset reflecting on the water. The silhouette of the trees in the distance quiet breathtaking highlighted by the colorful sky. Slowly the little fairy reappeared. “I have run away from my tribe. They were mean to me and because my ability is different then their’s. I went through so many very sad things. Now I have scars from it, see? That is why I am so lonely. I am waiting for the reign to come to wash away my tears” Turning her back showing the scars to Liza. “That is because of you and your kindness and understanding. Green is a fairies happy color. My wings also reflect what I am looking at that is beautiful to me. 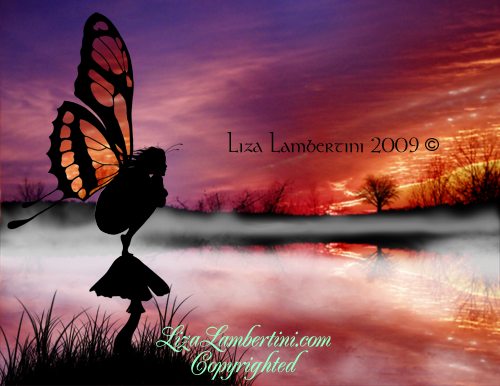 See?” Looking up at Liza her wings reflected the kindness in her eyes. Getting up they made their way back to Liza’s home. Opening the front door Reign flew in to see fairies inside Liza’s house. They were laughing and singing, merry and bright. Gathering around the new fairy they all admired her wings and how beautiful they were. “Look your wings heal other too! I am handsome inside!” said Snoggy (the positive goblin) admiring himself in Reigns wings. Reign’s wings grew even more beautiful. “Reign may I speak to you a moment? Do you mind giving us some privacy?” Turning toward the other fairies Liza gestured toward the other room. “No they are not and they are very powerful, more so because of the love they have here. We meet each others needs and grow from that special place. I have a request would it be ok if I did a portrait of you sitting on that mushroom as I found you today.? “Oh it was your wings they turned a gorgeous green with little flecks of iridescent yellow? That was a giveaway!” Liza said laughing. “Yes, Yes, Yes! Lets do this! What about humans, do you think that this will have an effect?” Reigns wings changed to a sunshine yellow and green, illuminating the entire kitchen.